One Man Left Studios » Tilt to Live Sale – This Weekend Only! Tilt to Live Sale – This Weekend Only! 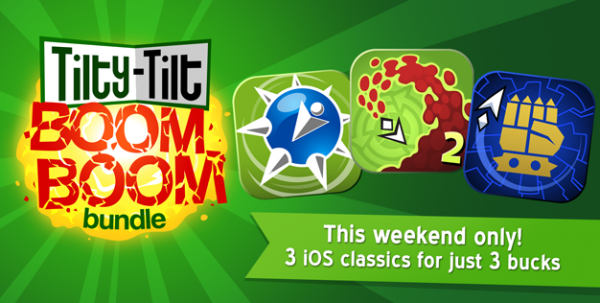 All this weekend, the Tilty-Tilt Boom Boom Bundle is on sale on the App Store for just $2.99 (slashed down from $5.99)! Included, you’ll find three classic iOS arcade games: Tilt to Live, Tilt to Live 2: Redonkulous, and Tilt to Live: Gauntlet’s Revenge. Three great games for just three bucks! It’s a perfect opportunity to complete your collection, or to experience the destructive power of the accelerometer for the very first time. Tilt to Live is the arcade game that started it all! Using precise, customizable tilt controls you’ll shock, shred, and nuke your way through hordes of relentless red dots using an arsenal of satisfying weapons, including cluster missiles, ice blasts, vortexes and more. Tilt to Live 2: Redonkulous turned that formula up to 11, adding even crazier weapons like the laser mace and the “perforator”. Also a first for the series were new “weapon tricks” to multiply your points, challenging boss fights for those who lived to find them, and bonus rounds to push your highscore over the top. Last but not least, Tilt to Live: Gauntlet’s Revenge is an uber-challenging spinoff, a Tilt to Live like no other. See how long you can survive without your precious weapons to help you. If you have what it takes to unlock the final gauntlet, you’ll go head-to-head with the Dot King himself. All of these for just three bucks! But you’ll have to act fast, because this special sale ends Monday evening. You might also consider signing up for a reminder email for our upcoming cooperative board game, Space Food Truck. It’s coming to Steam later this year, with a tablet release planned shortly thereafter.